Some brave souls have managed to close their Facebook account, or somehow managed to never open one in the first place. As for the rest of us, most of us use Facebook on a regular basis, either to catch up with old friends, stay in touch with faraway family, or to stay updated on favorite brands and groups. But no matter what it is you actually do on Facebook, you’re pretty much stuck with the same old interface. True, this interface keeps changing on us every few months, but whatever Facebook provides, we have to use. A small web app called LeFeed for Facebook wants to change that. LeFeed revolves around some algorithms that analyze your Facebook usage to provide recommendations and keep your feed as interesting as possible. But aside from those capabilities, LeFeed also provides a fresh interface through which to browse Facebook, for those who are tired of the old news feed Facebook provides. You an do everything through LeFeed, which is a shame, but it’s still a great alternative Facebook interface if you’re fed up or bored with your regular news feed. 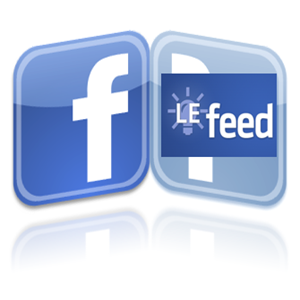 To work with LeFeed, you would naturally need to give it some access to your Facebook account. Once that’s out of the way, you can set up which feeds LeFeed shows on your main page. One of the cool things LeFeed does for you is filter your feed by categories, so you can easily browse only links, only photos, only status updates, etc. You can decide which filters will be showed through the settings. As mentioned above, you can’t do everything through LeFeed, but you can post a status update, like posts and share them though the app. Another functionality LeFeed provides is the ability to vote Facebook posts up and down, thus helping its algorithm learn who and what you like. You can choose to automatically like every post you vote up, although I’m not sure why this would be useful. If you don’t want this to happen, make sure to disable it through the settings, as it’s on by default. You can also choose whether you’d like to see photo and video thumbnails in your feed, and this pretty much sums up the entire set up process of LeFeed. Note the different tabs I chose to have, which offer filtered news feeds and recommendations. At first, the recommendation tab will be empty – LeFeed still doesn’t know much about you – but once you start using it, you’ll start getting recommendations as well. To help things along, you can start voting posts up and down using the plus and minus icon on the left side of each post. This will help LeFeed learn which of your friends you’re more interested in, and which types of posts you prefer seeing. Based on these, it will curate your news feed, and also provide recommendations. While recommendations take some time to appear, you will see the changes in your feed the next time you refresh your feed. Read comments (you can’t comment on posts through LeFeed). Access the post on Facebook with one click (click on “Post link”). Access only the media with one click (click on “Media link”). View single images in a beautiful lightbox. Share a post (opens a separate Facebook page). As you can see, LeFeed is more about enjoying your feed in a new, curated interface, and not about the actual things you do on Facebook. If you’re an avid reader but don’t interact much, this can be perfect for you. Yes and no. While LeFeed is a great alternative to the regular Facebook interface, it’s still not perfect. In my experience, it doesn’t always show every post, and when you first start voting things up and down, you may get posts from a certain person flooding your entire news feed. But like every good thing, LeFeed gets better with time, and the more you use it, the more you’ll like it. If you decide you don’t like it, you can easily delete your account through the settings, no strings attached. So go ahead and give LeFeed a try, and let us know in the comments what you think! We’d also love to hear of other ways to get an alternative Facebook experience, do you know of any? I have a problem in facebook comments, i doesn't delete my unwanted comments. You mean in Facebook itself? What happens when you delete a comment? We are very glad that you liked lefeed! Please let us know if you have any questions/feedback about lefeed. It sounds like a good thing, I hate the way Facebook chooses, they really only show you the people who are posting a lot and it doesn't matter what your settings are really. When you need to have a large 'friends' list, it would be handy to have something to sort them out! Sweet. Facebook could learn a thing or two from this.